Navigate to Administer - Site configuration- Dynamic display blocks in the admin menu. Navigate to Administer -- Site configuration -- Dynamic display block in the admin menu. Instances can be made from any block which has multiple content. Blocks made with the Headerimage module (which gives flexible conditions to select and display nodes). Blocks made with the views module in general. Working together with the headerimage module and views makes retrieving and displaying content with the dynamic display block module very flexible. 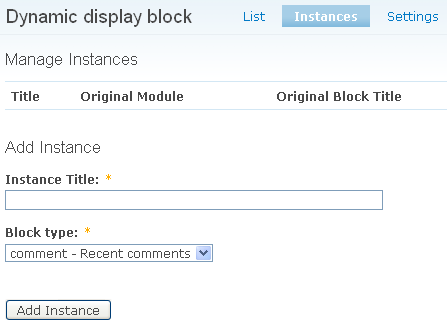 Type a title for the dynamic display block in the Block title field to override the standard block title or type for no block title.